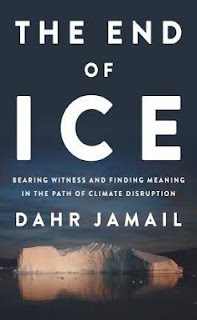 Tomgram: Dahr Jamail, "We Can't Undo This"
Dahr Jamail, a TomDispatch regular, reported strikingly from Iraq in the years after the 2003 American invasion of that country. Since then, he’s refocused the skills he learned as a war reporter on covering a fossil-fuelized war against the planet (and humanity itself). It goes by the mild name of climate change or global warming and, while a Trump tirade about the border or just about anything else gets staggering attention, the true crisis this planet faces, the one that our children and grandchildren will have to grimly deal with, remains distinctly a secondary matter not just in the news but in American consciousness. Yes, opinions are slowly changing on the subject, but not nearly fast enough. Something about the time scale of this developing crisis -- no less that it could, in the end, take out human civilization and so much else -- makes it hard to absorb. It’s increasingly evident that we are already living on a climate-changed planet whose weather is grimly intensifying. If you doubt this, just ask the inhabitants of Puerto Rico, Houston, or Paradise (California, that is). Its most devastating consequences will, however, be left to a future that still seems remarkably hard to absorb in an era of the endless Trump Twitch and in a time when we’re becoming ever more oriented to the social media moment. Given how deeply their culture is tied to a subsistence lifestyle coupled with the new reality that the numbers of fur seals, seabirds, and other marine life they hunt or fish are dwindling, how could this crisis not be affecting them? Just before flying to St. Paul, I met with Bruce Wright in Anchorage, Alaska. He’s a senior scientist with the Aleutian Pribilof Islands Association, has worked for the National Marine Fisheries Service, and was a section chief for the National Oceanic and Atmospheric Administration for 11 years. "We're not going to stop this train wreck," he assures me grimly. "The Pribilofs were the last place mammoths survived because there weren’t any people out there to hunt them. We’ve never experienced this, where we are headed. Maybe the islands will become a refuge for a population of humans." I asked him what he would say to people who think we still have time to mitigate the impacts of runaway climate change. "We can't undo this," he replied. "How are you going to cool down the ocean? We're already there." In July 2017, I traveled to Camp 41 in the heart of the Brazilian Amazon rainforest, part of a project founded four decades ago by Thomas Lovejoy, known to many as the "godfather of biodiversity." While visiting him, I also met Vitek Jirinec, an ornithologist from the Czech Republic who had held 11 different wildlife positions from Alaska to Jamaica. In the process, he became all too well acquainted with the signs of biological collapse among the birds he was studying. He'd watched as some Amazon populations like that of the black-tailed leaftosser declined by 95%; he'd observed how mosquitoes in Hawaii were killing off native bird populations; he'd explored how saltwater intrusion into Alaska's permafrost was changing bird habitats there. Orinthologist Vitek Jirinec at Camp 41. "It's extraordinarily challenging to get to the 1.5 degree Celsius target and we are nowhere near on track to doing that," Drew Shindell, a Duke University climate scientist and a co-author of the IPCC report, told the Guardian just weeks before it was released. "While it's technically possible, it’s extremely improbable, absent a real sea change in the way we evaluate risk. We are nowhere near that." To put this in perspective: just a two degree rise will leave dozens of the world's coastal mega-cities flooded, thanks primarily to melting ice sheets in Greenland and Antarctica, as well as the thermal expansion of the oceans as they warm. There will be 32 times as many heat waves in India and nearly half a billion more people will suffer water scarcity. At three degrees, southern Europe will be in permanent drought and the area burned annually by wildfires in the U.S. will sextuple. These impacts, it’s worth noting, may already be baked into the system, even if every country that signed the Paris climate accord were to fully honor its commitments, which most of them are not currently doing.